MommaSaid | Does “Choose to Be Happy” Piss You Off? Browse: Home / 2013 / January / 17 / Does “Choose to Be Happy” Piss You Off? Does “Choose to Be Happy” Piss You Off? When people tell you to “Choose to Be Happy,” does it piss you off? You’re in a bad mood, and someone tells you that you woke up that morning and chose to be that way. All you have to do is choose to be happy and voila! You’re happy. Which is kind of like saying all you have to do is choose to be a ballerina-astronaut who lives in the White House, and just by thinking it, it will happen. But I’ve learned in two years of therapy and studying Focusing that positive self-talk can’t change what your body knows. Deep down inside you there’s a “Felt Sense” that understands why you’re in a bad mood. It’s behind your feelings and thoughts. Quashing it or ignoring it won’t make it go away. In fact, if you let your head override what’s deep in your body, your body may rebel with a migraine, back pain or an ulcer, for instance. learn to “sit with it,” ask it what it needs and validate that it’s there. Don’t talk yourself out of it — but don’t wallow in it either — and you could, dare I say, get happy. Definitely. I think there is tremendous pressure on cancer patients to be “brave,” more than with any other illness. But we do that to cancer patients, too,Christina. It’s what Jimmie Holland of Sloan-Kettering calls “The Tyranny of Positive Thinking,” which puts the pressure of putting up a fight and thinking positive during cancer. It’s true that your mental state affects your health, but stuffing your true feelings does, too. Over at ParentingWithCancer.com, I tell cancer patients that they are entitled to feel fear and sadness. In fact, those feelings are normal. Learn to validate them but don’t get so close that you fall in. 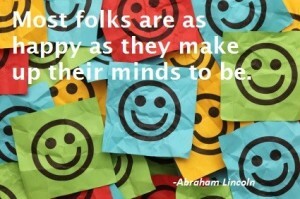 There is some research to show that acting happy (generally by smiling) will lift your mood. That said, I think the people who say that you can “make yourself happy” haven’t truly been depressed. Some of depression really is chemical–it can come on because of the weather, because of passing neurological weirdness, from lack of sleep, whatever. Just telling yourself “be happy” when your brain is saying “I suffer,” just doesn’t cut it. When I’m deep in it, all the reframing in the world doesn’t do squat. Just have to normalize it and wait it out.